Anthony’s first ingress into the performing arts was at age 8 when his parents convinced him to learn and perform Chinese lion dances. He then stumbled upon breakdancing during a national speech and debate tournament in middle school, and at the age of 16, he had his first foray into swing dancing alongside other young interns from a research laboratory. Since then, he has trained in other dance styles ranging from hip-hop to West Coast Swing, but most of all he enjoys using this background to expand upon his technique and creativity in Lindy Hop. On the social dance floor he is known to be playful, musical, creative, and clear. 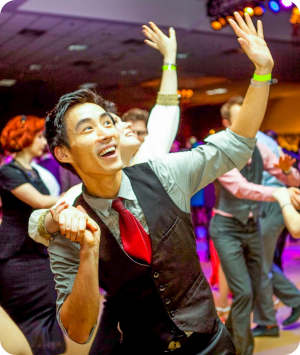 He holds first place titles from events such as Lindyfest and Lone Star Championships, Montréal Swing Riot, Ultimate Lindy Hop Showdown, Lindy Focus, and International Lindy Hop Championships. Combined with his professional background in education, his love of both leading and following have been instrumental to making the classes that he teaches both clear and intuitive. He is an active scene builder in his community and founded the non-profit Salt City Swing, where he teaches locally.